SONOMA, Calif. (February 1, 2017) – Sonoma Valley Visitors Bureau, the destination marketing organization (DMO) tasked with promoting Sonoma Valley as a destination, announced its new consumer-focused campaign, “Experience Sonoma Valley, California.” The campaign aims to provide a distinctive, truly one-of-a-kind experience to all guests visiting the 17-mile region within Sonoma County. 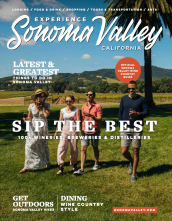 With a revamped website, marketing collateral, promotional photography, videography assets and television commercials that reflect the new campaign, the Sonoma Valley Visitors Bureau is poised to craft a sophisticated and charming, yet down-to-earth personality for the destination. The foundation of “Experience Sonoma Valley, California’s” new consumer initiative is the launch of last month’s Sonoma Valley Delicious!, a celebration of all things epicurean in Sonoma Valley throughout January. Locals and visitors alike had a chance to experience the area’s participating restaurants, wineries, tasting rooms, olive producers, cheese makers, bakeries, breweries, retail shops and more at reduced rates, as well as special offerings, promotions and tours. The first destination video commercial promoting the new campaign has been running non-stop on television networks across California and the imagery has been used in national marketing campaigns, including the national newsstand cover of Touring & Tasting magazine. Sonoma Valley’s scenic 17-mile span offers endless discovery for new and repeat visitors. The birthplace of the California wine industry, it continues to delight discerning palates and rack up awards for its dazzling vintages - produced by wineries of all shapes and sizes. Serene vistas of rolling vineyards and lush farmland stretch as far as the eye can see, and postage stamp towns glow with as much character as the local wines. Guests can anchor their visit in Sonoma Plaza, the #1 attraction to visit in Sonoma, or expand their horizons. The Plaza&apos;s old adobe storefronts, meandering alleyways, sunlit courtyards and historic landmarks hum with an eclectic mix of restaurants, hotels, tasting rooms, cafes, artisan boutiques, galleries – even a vintage movie house. The Sonoma Valley Visitors Bureau is the region’s destination marketing organization representing more than 350 hospitality-related businesses. The Bureau coordinates the collection and dissemination of information about Sonoma Valley to visitors, residents, travel writers, publications and other interested parties. The Bureau operates two visitor centers, which are open year-round, seven days a week to welcome visitors to Sonoma Valley. For information on Sonoma Valley, please call the Sonoma Valley Visitors Bureau toll free (866) 996-1090 or visit www.sonomavalley.com. For maps, guides, and touring instructions, stop by the Sonoma Valley Visitors Bureau (23570 Arnold Drive at Cornerstone Sonoma or on the Sonoma Plaza at 453 First Street East). Experience Sonoma Valley, the consumer facing brand of the Sonoma Valley Visitors Bureau (SVVB), is the official destination marketing organization of Sonoma Valley, California. It coordinates the collection and dissemination of information about Sonoma Valley to visitors, residents, travel writers, publications and other interested parties, and operates two visitor centers, which are open year-round, seven days a week to welcome visitors to Sonoma Valley. The Sonoma Valley Visitors Bureau operates two visitor centers, one at Cornerstone Sonoma, the other on the historic Sonoma Plaza.